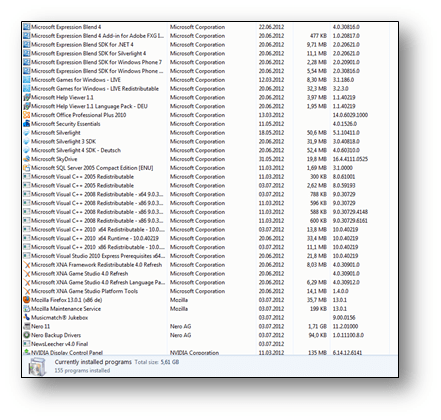 Windows Tools, Help & Guides » Blog Archive » Windows 8: The Same Old Microsoft Operating System? Windows 8: The Same Old Microsoft Operating System? The imminent release of Windows 8 has us all on the edge of our seats, and wondering how big the performance and power enhancements will be. Will the new operating system actually live up to its hype? In conducting preliminary benchmarks, we found that Windows 8 managed to beat Windows 7 in the performance department in almost every discipline. With our interest peaked, we decided to take our tests one step further to identify how the installation of third-party applications, or crapware, affect the new operating system’s performance. To do this, we added 150 programs [Figure 1] to our solid 2009 Core 2 Duo with 3 GHz, 4 GB RAM and a 256 GB SSD drive using the RTM version of Windows 8, and measured the impact on resource usage, boot time, application launch speed and battery life, among other areas, over a two-month period. So, how did Windows 8 fare under the stress of the 150 programs? Let’s check it out! We didn’t limit our performance tests to those listed above—we also examined other measurements that consumers care about, like multimedia file conversion, photo resolution conversion and gaming performance. We were also curious to see if and how much basic optimization helped. For that, we used our own software’s tuning tools including TuneUp Program Deactivator, Turbo Mode as well as Startup Manager. Go through the list of all of your installed programs and decide if you still need all of them. Clean up your system using our tips. Be sure that only the most necessary start-up applications load automatically when you turn your PC on. Want to reap the performance benefits of Windows 8? Rid your ultrabook, tablet or PC of crapware to keep your shiny new system clean and fast from day 1. I’m not sure this is fair to Win8. It is true that Windows Desktop Applications will slow down your machine. However, I’ve noticed that installing every single app on the Windows Store did little to affect desktop performance. Should this be taken into account? I believe most users will become accustomed to and use the Win8 apps, particularly when Microsoft has worked hard to make apps like Skype better as a Win8 app. true, you just have to take in account that this article is a advertorial trying to sell you the program whilst that software probably causes some instability issues on your pc and that kind of crap.